Slides from the presentation by Jim Demarest of ViiV Healthcare. Antiretroviral regimens containing the recently approved HIV integrase inhibitor dolutegravir (Tivicay) demonstrated high rates of viral suppression even in treatment-experienced people who had virus with resistance to NRTIs. Among people starting treatment for the first time, no resistance was detected through 96 weeks, according to study findings presented at the 20th International AIDS Conference (AIDS 2014) this week in Melbourne. Modern antiretroviral treatment is highly effective and generally well-tolerated, but novel agents – especially in newer drug classes – can offer valuable options for people such as those with resistance to existing drugs and those who have difficulty tolerating specific side-effects. Jim Demarest of ViiV Healthcare and colleagues performed a post-hoc combined analysis looking at virological outcomes among participants enrolled in phase 3 trials of dolutegravir-based regimens. The SPRING-2, SINGLE and FLAMINGO studies looked at people who had not taken treatment before (treatment naive), while SAILING enrolled treatment-experienced people with resistance to at least two drug classes who had not yet used integrase inhibitors. All the treatment-naive studies performed resistance testing at baseline and excluded people who were resistant to study drugs. In SAILING, resistance to two or more drug classes was an inclusion criterion, and baseline resistance testing was used to select an optimised background regimen. All studies called for additional resistance testing if participants experienced virological failure (either failure to achieve viral suppression or viral rebound while on treatment). The first three trials found that dolutegravir plus two nucleotide/nucleoside reverse transcriptase inhibitors (NRTIs) worked as well as or better than the older integrase inhibitor raltegravir (Isentress), the non-nucleoside reverse transcriptase inhibitor efavirenz (Sustiva) and the boosted protease inhibitor darunavir (Prezista), respectively. In the treatment-naive trials, no study participants developed emergent resistance to either dolutegravir or the background drugs through 48 or 96 weeks of follow-up. SAILING showed that dolutegravir bested raltegravir in treatment-experienced people. In this study, 71% of participants assigned to receive dolutegravir plus a background regimen achieved virological suppression (50 copies/ml) at 48 weeks, compared with 64% of those assigned to take raltegravir. Among SAILING participants who experienced protocol-defined virological failure, there was significantly less emergent drug resistance in the dolutegravir arm than in the raltegravir arm. Integrase inhibitor resistance was detected in 1% and 5%, respectively, while resistance to background drugs was seen in 1% and 3%, respectively. Response rates were similar for SAILING participants who either had never used boosted darunavir (67% in the dolutegravir arm vs 60% in the raltegravir arm) or had done so and had no primary protease inhibitor resistance mutations (69% vs 70%, respectively). Among people taking darunavir who had primary protease mutations, however, dolutegravir performed significantly better (86% vs 67%). Among people who included any protease inhibitor in their regimen, half as many experienced treatment failure in the dolutegravir arm compared with the raltegravir arm (6% vs 12%). Among the 32 SAILING participants who received dolutegravir with only two NRTIs (nucleoside reverse transcriptase inhibitors), none experienced protocol-defined virological failure, even if both of their background NRTIs were not fully active due to resistance. In contrast, 22% of participants assigned to take raltegravir plus two NRTIs did experience virological failure. SAILING included 25 participants whose background regimen included lamivudine (Epivir) or emtricitabine (Emtriva, also in several co-formulations) and who had the M184V viral mutation, which confers resistance to these drugs. None of the participants in the dolutegravir arm experienced virological failure – even if their second NRTI also appeared to be compromised by thymidine-analog resistance mutations – compared with one-third of those taking raltegravir. "Dolutegravir-based regimens showed substantial and durable antiviral activity" in integrase inhibitor-naive patients, the researchers concluded. "The resistance profile for dolutegravir will be defined further by use in clinical practice and additional clinical trials." Regulators in the US are currently evaluating a fixed-dose co-formulation containing dolutegravir plus abacavir/lamivudine (the drugs in Kivexa or Epzicom). If this is approved, it will be the first one-pill, once-daily regimen that does not contain tenofovir DF, which some people wish to avoid due to its risk of kidney and bone toxicity. The combination, due to be marketed as Triumeq in Europe, has already received scientific approval by the European Medicines Agency and is expected to receive marketing approval within the next few months. Demarest J et al. 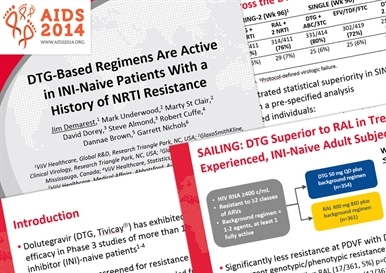 DTG-containing regimens are active in INI-naïve patients with a history of NRTI resistance. 20th International AIDS Conference, abstract TUAB0104, Melbourne, 2014. NAM’s AIDS 2014 bulletins have been made possible thanks to support from Bristol-Myers Squibb. NAM's wider conference news reporting services have been supported by AbbVie, Gilead Sciences, Janssen and ViiV Healthcare’s Positive Action Programme.